I’m always happy to join in for Snapshot Saturday, hostessed by Melinda at West Metro Mommy Reads. Such a great group of bloggers gather there every week. They all seem to have quite a knack with photography as well. Be sure to check them out when you’re finished here. Most of the trees in our area have lost their leaves. In fact, the young man who takes care of our yard work needs did a Homeric job of raking all of them in our yard. I don’t know how he does it, he’s in college and works another job, but he never forgets us. Great kid. I should go take a photo of all the leaves in the gutter. I may do that. But instead of showing you the piles of leaves, I’m going to share a beautiful sky from this past week. In the yard next to us, there are three huge maple trees. I’ve shown them before in their Autumn glory. One day earlier this week, there was an amazing sky and although the trees now have just a few leaves left, the view was intense and beautiful. The sky was incredibly blue with a base of white clouds topped by splashes of grey clouds. It looked like a painting. I was happy that this seemed to translate well into my photo. Autumn is beautiful from start to finish. My favorite season. I love it every time. Be sure to check out the other bloggers over at West Metro Mommy Reads. I know you’ll like what you find. 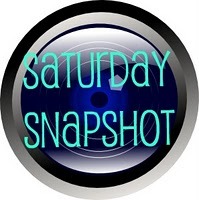 Snap – I’ve posted a photo of a nearly bare maple – a little Japanese maple. 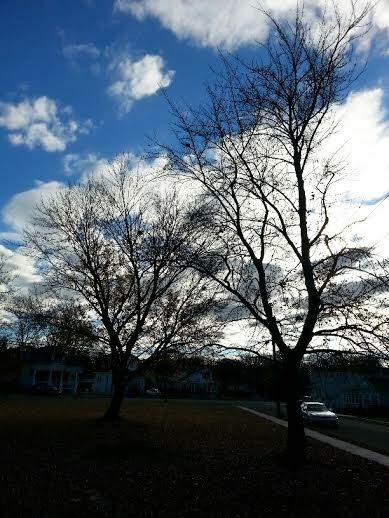 Your maples show up beautifully against the white clouds – lovely photo. Thanks, Margaret! Glad you like it. Such a wonderful photo. Worth writing a poem! May I? You absolutely may, Gautami! Glad you like it! Love the look of the trees against that brilliant sky! Gorgeous shot…It almost looks like a painting. Definitely frame-worthy. Thanks for sharing, and for visiting my blog. Happy Thanksgiving! Thanks, Laurel! Glad you like it. Frame-worthy, huh? I take that as a high compliment! That is a beautiful sky. I love those November days when I see bare branches against blue sky. We’ve been getting more gray day, recently, but it looks like we have some clear ones coming up in the next week. There’s nothing quite like the ever changing sky to always capture our cameras. Sky through bare branches is one of my favourite shots too – it can feel gothic, even on a sunny day! What a beautiful sky! We had such a pretty day in ATL – it was cold but the sun and the bright blue sky called me outside. Hope you had a wonderful day! Thanks, Laura. Spent most of it indoors but I’m on a mission. I stick my head out once in a while to see that the world is still there. I’m pushing ahead! It certainly is an intense, beautiful blue. Thanks, Louise. I was really happy with it.